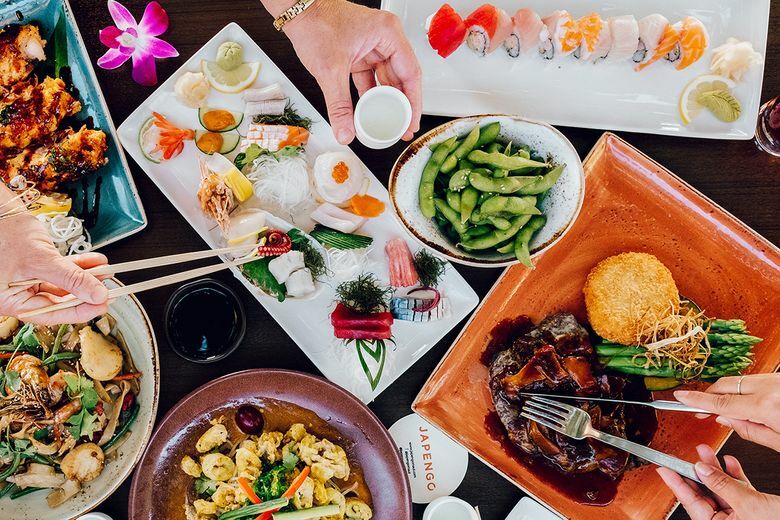 Restaurants like Japengo at Hyatt Regency Maui Resort & Spa make the most of Hawaii’s local fare. Hawaii Food & Wine Festival showcases local, sustainable fare in lush, tropical setting. The acclaimed Hawaii Food & Wine Festival celebrates the unique swirl of Polynesian and Asian flavors running through island cuisine, from inexpensive fare served on the balmy streets of Kaanapali to the epicurean delights served in the emerging town’s finest restaurants. The late iconic celebrity chef/travel documentarian Anthony Bourdain had seen it all and was typically critical, however, the charismatic New Yorker was particularly fond of Hawaiian cuisine. Bourdain was spot on when it comes to the culinary delights of Hawaii. The Hawaii Food & Wine Festival, held annually in October, taps the traditional and the innovative to showcase all the islands have to offer. Wine tastings, culinary events and mixology creations are among the highlights of the much ballyhooed event, to be held October 5-27 on Hawaii, Maui and Oahu. October 18-20, the lush paradise of Kaanapali Beach Resort on Maui will host festival events. The chefs have yet to be named but expect an announcement in early spring. The unparalleled culinary feast of 2018 featured two of Hawaii’s own James Beard Award-winning chefs, Roy Yamaguchi and Alan Wong. A roster of more than 100 internationally known master chefs, culinary personalities and wine and spirit producers helped turn the event into an unforgettable occasion in a stunning oceanfront setting. Foodies can wait until autumn to enjoy memorable dining experiences provided by renowned chefs and cooking personalities, who have earned notice for their artistry in a variety of Kaanapali bistros. But those who would like to indulge in Hawaiian treats sooner rather than later can visit prior to the festival to enjoy the bounty of Maui. The combination of the chefs’ innovation and the fresh, homegrown ingredients, local produce, seafood, beef and poultry from Kaanapali’s mountains and sea make for unusual and satisfying fare. There are a number of options for a memorable dining experience in Kaanapali. Pulehu is the latest restaurant to open at the Kaanapali Ocean Resort Villas, one of Kaanapali Resorts’ five-luxury condominium or villa properties. Executive Chef Francois Milliet serves up classic Italian fare with island flair. Find a selection of flatbreads, meats and seafood, much of it sourced locally, such as Surfing Goat Dairy cheese, poached Molokai prawns and Hamakua mushrooms. The Hula Grill offers local, line-caught fish and Maui-grown produce. Speaking of island delights, when you think Maui, the macadamia nut comes to mind and that brings us to the old-fashioned ice cream shop the Royal Scoop. The retro shop features the unique macadamia nut ice cream, as well as a variety of other Maui-made ice cream, along with such comfort food as frozen yogurt, muffins and pastries and specialty coffees. The common denominator from appetizers to desserts is farm to table. Maui chefs support the “Growing Future Farmers” initiative. It’s about backing the next generation of farmers and ranchers in Maui County. Fresh and local is the latest mantra but Kaanapali also gets old school. There is nothing like a traditional luau. It all starts with the lei greeting and continues with reverberating drumbeats and a climactic fire-knife dance. While experiencing the full-on spectacle you’ll enjoy a full-on-luau under a star-filled night sky. The Kaanapali Resort includes five luau. The recently relaunched “Drums of the Pacific Polynesian Spectacular” at Hyatt Regency Maui Resort & Spa; the Wailele Polynesian Luau at the Westin Maui; the Maui Nui Luau at the Sheraton; the Royal Lahaina Resort Luau; and The Legends of Ka’anapali Luau at Ka’anapali Beach Hotel. In terms of culinary wonder, Kaanapali is a unique destination that will leave an indelible impression. When you’re not sampling the local delicacies, you’ll bask under the sun on the pristine beaches of Kaanapali. There are more than 80 stunning beaches in Maui, so the choices stretch on and on. The Top Ten U.S. Beach list ranks beautiful Kaanapali Beach in the No. 2 spot. The best-of-the best picks in the entire world named Kaanapali Beach the 14th best on Earth. Gorgeous, pristine beaches and some of the finest restaurants in the world make Kaanapali Beach Resort a bucket list destination. Kaanapali Beach Resort is a completely self-contained vacation destination on a three-mile stretch of beach. Whether you want a romantic getaway or a fun family vacation, you will never be at a loss for something fun to do in Kaanapali.